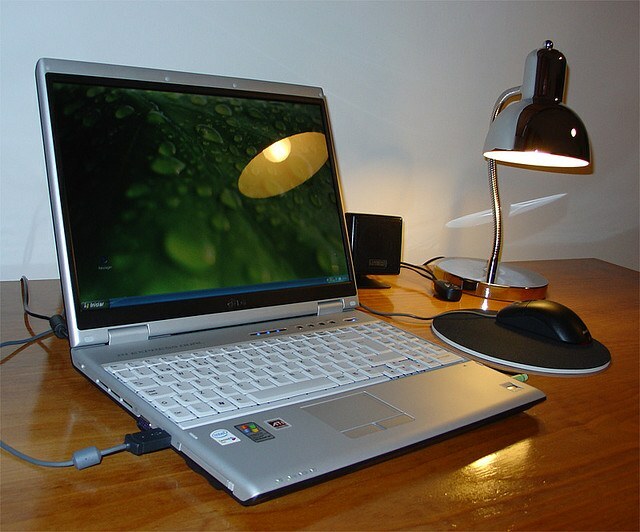 Sometimes it is convenient to use the connectors for microphone and headphones from the front panel of the computer. Well if you showed how to do it, at the time of purchase in the store. But dealing with the connection of the microphone at home is also not so difficult. The main thing - to observe a few simple rules. 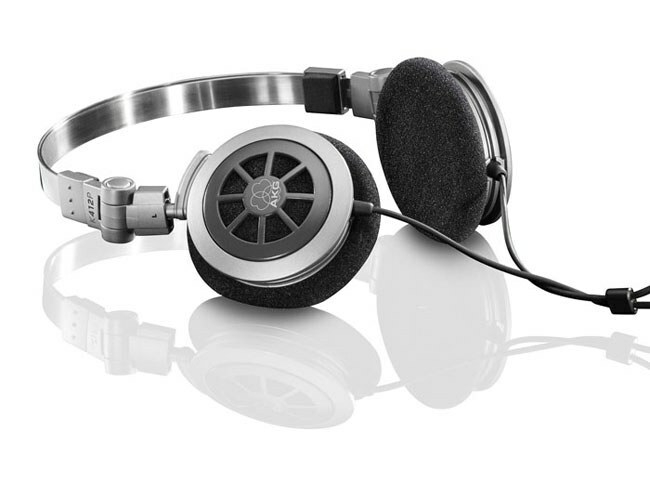 - headphones or speakers for audio output. First, turn on computer, wait for the download and prepare a working microphone. If it works from the connectors at the rear of the system unit, then you can try to connect it on front panel. Usually there is a connector pink (with the icon of the microphone). For testing the fit program supplied with the sound card drivers (for example, Manager HD Realtek) or sound Recorder that you can easily find, follow the path start - > All programs - > Accessories - > Entertainment". If the microphone is not included (this can signal a fixed scale), we first check the program of the microphone. Look in the system tray the loudspeaker icon and double-click on it. In the window that appears the main settings of a sound select "Properties" –> "Mixer" –> the input device (input). For example, it may be Realtek HD Audio Input. Select settings "Mic Volume". Closing the window, you will see the volume control recording with the microphone. The icon of the microphone should be active and installed at least half of the scale. An alternative path for these settings: "control Panel" -> "Sounds and audio devices - > Audio - > sound Recording - > Volume". If recording continues, check the auto-detection mode sockets front panel. This window Manager is the program responsible for your audio device. Reinstall the top check mark as shown in photo and then check the recording microphone. 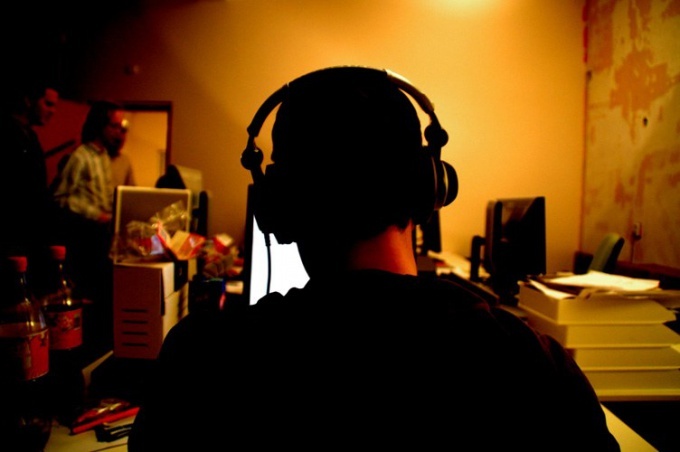 Often it is because the active auto-detection may conflict audio devices. If you have not achieved success, then you should restart the computer and enter the BIOS. There click "Advanced Settings". Under "Chipset Configuration" may be setting the "Front Panel Control". Forcibly set its value as "Enabled" (instead of "Auto"). After restarting again try to activate the microphone with the front panel. Another danger can wait for you if when you build the computer to the motherboard was not connected audioslav the front panel. You can check it out, if you open the side cover of the system unit and inspect the connections. If you have the manual to the motherboard, where the connectors, and you have pinpointed where you want to paste audiosnap can do it yourself. Note - if the computer is new, and his body is sealed, you should seek assistance from the sellers not to lose the warranty. For connection, only use trusted microphone. The motherboard is one of the most important parts of a computer. In fact, it is the link between all devices that are part of the architecture of the system unit, as they are all connected to her. This feature makes the replacement motherboard a long and tedious process that requires full focus, concentration and restraint. The process of replacement does not seem to be particularly difficult, but nevertheless, it has a huge number of nuances and pitfalls. The choice of the motherboard. When choosing a new motherboard under existing devices, consider the following elements:1. The socket of the processor. 4. The type of connection the hard drive. 5. The number of PCI ports. Write down all these settings (5th if necessary) and buy the parent fee, to meet your requirements. Removing the old motherboard. Remove the left cover of the system unit. Disconnect all devices from the motherboard and remove them. The most difficult is to remove the CPU and its heatsink. Be careful not to touch pins of the processor with your hands, and in the case of erasing thermal paste – apply new when you connect to the new motherboard. Disconnect the power to the motherboard (usually two loop). Unscrew all the screws that the motherboard is attached to the system unit and remove the old parent fee. Install a new motherboard cost and securely fasten it with screws to the housing unit. Connect the power to the motherboard, and then all the devices you have available. Please note a few points:1. If you have multiple RAM modules, plug the same strap into the slots of the same color. This improves the performance of the RAM. 2. Connecting the CPU, make no mistake about its location relative to the socket. 3. 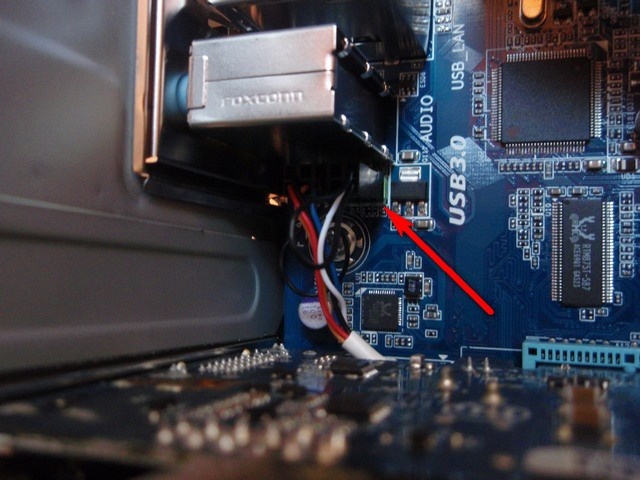 In case that your hard drive format IDE and the new motherboard works with SATA, it is possible to connect the hard drive to the ribbon cable from the DVD. 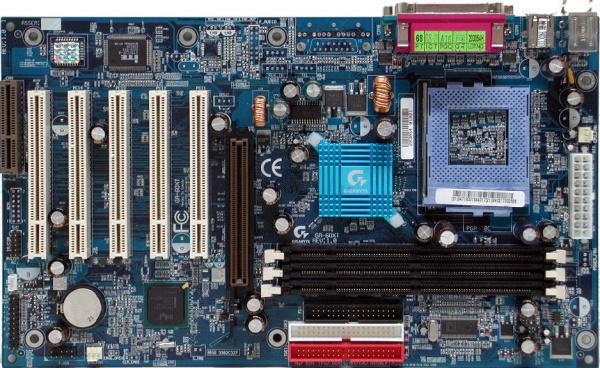 To facilitate the installation of devices, CPU with heatsink and RAM better connected to the fixing Board to the unit. 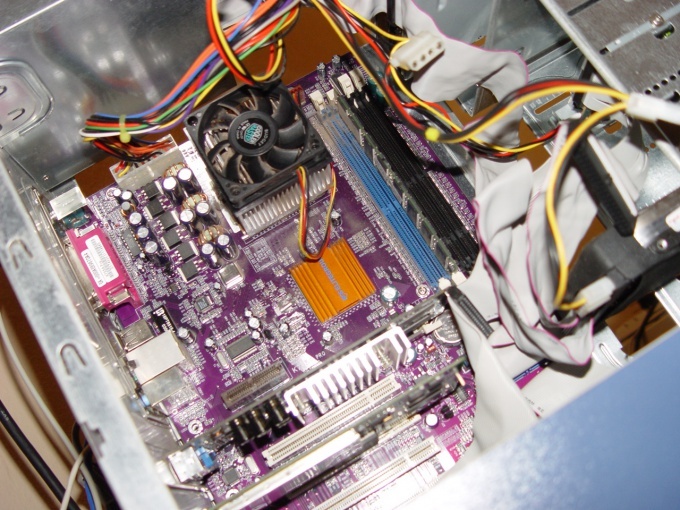 The first stage of the installation components in the system unit of a computer is to install the motherboard and connect the corresponding wires. 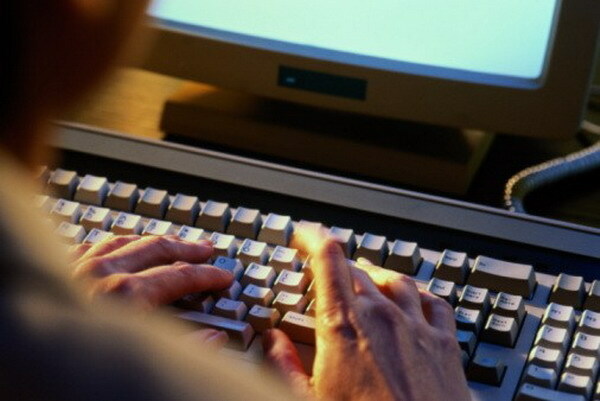 From the correctness of the connection will depend on the further functionality of the computer. • other wires from other components if necessary (for example, wire additional USB ports).Connect the wires to the mother Board should be in the order described below. To get the correct connection diagram, please check the user manual of the motherboard by downloading it from the manufacturer's website. The wire that supplies voltage to the motherboard from the power supply, combined into a single connector. In size it exceeds the others, and corresponds exactly to the contacts on the system Board. Connecting wire, tightly secure them using a special tab on one side of the connector. Following connect the power wire running from the cooler to the contacts on a card, denoted by the ID Fan. Then connect the wire from the signal lamps and buttons of the housing of the system unit to the appropriate terminals on the motherboard. Usually they are located in one place. Each contact is marked with a corresponding identifier, such as Pwr, and if connected incorrectly, the corresponding button or lamp will not work. After you have connected the power and other wires to the mother Board, insert the cables and the cables from the hard drives and optical drives in the appropriate connectors. After that, you may need to connect the wires to the mother Board from other devices, if provided for by their design. To define contacts for connection to pre-study the wiring diagram in the user documentation. During Assembly of the computer arises many questions, especially if it is the first time in my life, and the necessary experience just yet. 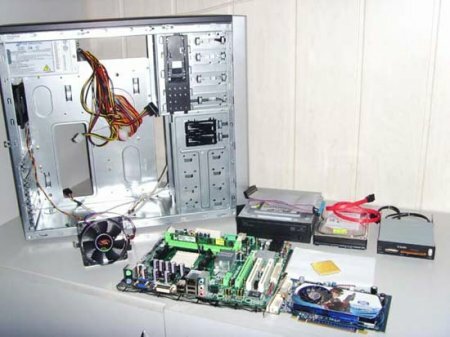 Where and how to install CPU, how to fix a hard drive, in which the connector is installed graphics card – all of these are simple for an experienced person treatments a beginner can seem complicated and confusing. Connect the wires to the mother Board only after it is installed in the system unit. 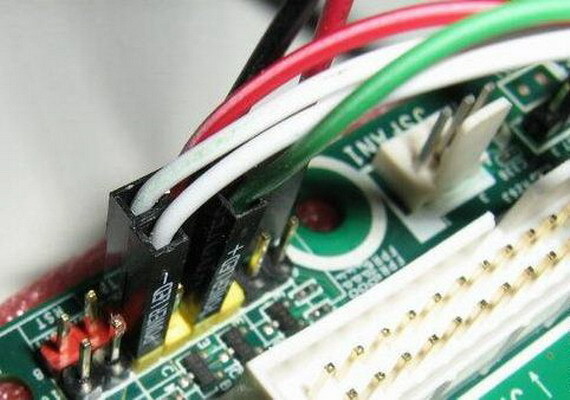 Despite the obviousness of this solution, many are trying to first connect all cables to the connectors, and then install the Board into the case. The correct order of the cable connections to mother Board the following: the motherboard is installed with CPU cooling, then the Board is mounted in the housing and only after this connect the necessary cables. First in the list of such cables is the power cable. It is a wire with a wide strip of the 24 or 20 pins arranged in two rows. It connects to the appropriate connector on the card, and stick it "on the contrary" cannot, interfere with the bevels keys inside pads. Gently insert it into the slot and gently press until the latch clicks into place on the Shoe. Connect the processor power cable. It has a 4-pin or 8-pin plug and socket for the connection is located in the immediate vicinity of the CPU socket. Now the most difficult – need to connect to the mother Board control buttons and sensors, the so-called "front panel". It seems difficult due to the fact that the connectors are different sensors and buttons are the same and to confuse them very easily. To avoid the error, look in the manual to the mother Board the place where the described connection diagram front panel (Front Panel). Connect the wires according to the instructions. It should be noted that to connect the off button (Power) and reset (Reset) is in the correct orientation, in contrast to sensors, power and hard drive activity, where the polarity is necessary. Configuring integrated sound card can be done in the BIOS. This can be useful if you need to disable the built-in sound card after installing an external sound card, or there was a need of sound settings at the hardware level. But be careful, when making changes. It would be nice to record the changing parameters and values in order that in case of failure to restore the previous state. At the beginning boot the computer enter the BIOS. Most often this can be done by pressing the Del key, at least – F2 or F9. Tip on the button to log usually appears at the bottom of the monitor when you turn it on. In the download window BIOS, find the section (or tab depending on version of BIOS) Integrated Peripherals. Press Enter to enter this section. Here is the configuration of the periphery. You will see the list integrated in motherboard devices. Look for Onboard Audio Controller or similar in meaning. Different versions of BIOS the name of the items and options may vary. Open the list of options located in this section. Now depending on your goals change option values. If you want to use the inbuilt audio controller, the parameter value HD Audio is set to the Disabled value, and AC97 Audio is enabled by setting the Enabled value. Conversely, if you connect an additional audio card, disable the built-in AC97 Audio controller. More fine tuning built-in sound card will be the following options: 16-bit DMA Channel 16-bit DMA channel to work integrated sound Board with direct memory access, bypassing the CPU. Option Base I/O Address allows you to set the address of the I/o to work with the sound card. The default value is 220. Option Audio Select IRQ sets the interrupt used by the sound card. The default setting is IRQ5. Save the changes in one way – by pressing the function key F10 or by clicking on the tab and selecting Exit Exit & Save. Confirm saving by typing the letter Y and pressing the Enter key. The computer will reboot, and you will start work with the new settings. If you build a computer you most likely included PC premika appropriate contacts on the mother Board with a screwdriver. This is a relatively convenient only at the Assembly stage. It is clear that in the daily work with closed body so no one will not do. So make sure that after its Assembly to connect the contacts on the mother Board to the button power on the PC case. Find the contact area on the mother Board. It looks like the group signed plug and is usually located in the lower right corner of the motherboard. Some motherboards can be found just a few contacts, but they are worn adapter with a pad. This feature, for example, differ in some models of Asus motherboard. Contacts for supplying power to the motherboard, usually marked as POWER_SW. In the same way marked wire coming from the button power the computer case. If marks on the mother Board not detected, refer to the instructions for your Board. It is usually indicated the order of the plugs on the respective contact pad, and you can easily determine which ones are responsible for the supply of power to the motherboard. To connect button power case to the mother Board simply plug and wire, signed as POWER_SW and extending from the housing, the respective contacts on the circuit Board. Polarity you observe optional. To check for correct wire connection plug the power cable into the unit 's power and turn on the computer by pressing the button on the case. If there is no response, once again check up correctness of connection of the wire pull and then paste it to neutralize the problem of bad contacts. If it fails, the case can be either in a defective button on the body, or faulty in the parent Board. To check the buttons on the case connect the wire RESET_SW in the same pair of pins as before. Note only that now to turn on the computer have a reset button (Reset). If this doesn't work, you will have to bear the motherboard (or better system unit as a whole) to the service center. Finally, if the fan on the processor spun, it means you've successfully connected button power case to the mother Board. 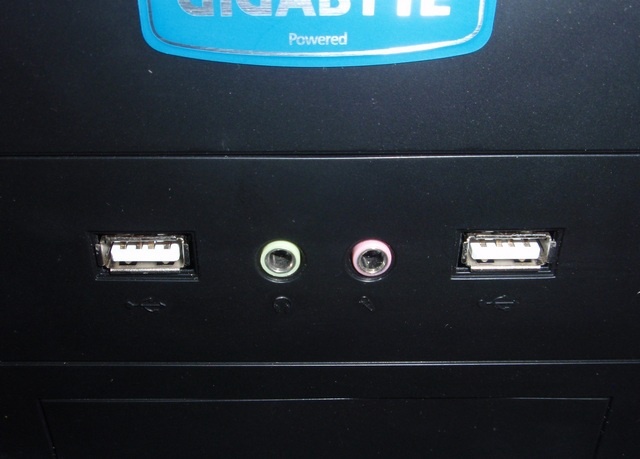 On the front panel of the system unit of the computer are the USB ports Universal Serial Bus ("Universal serial bus") and sockets for TRS connections (Tip, Ring, Sleeve - "Tip, Ring, Sleeve"). For headphones can be used both connectors. Start with driver installation if you connect need wireless headphones. In most cases, base operating system drivers is enough to do without user intervention. Insert the adapter or its connection cable (depending on model) in one of the available USB connectors on the front panel of the system unit. The OS will automatically detect the new device and will attempt to find in its database needs for his work driver. If the attempt fails, you will see a confirmation message. Skip this step if the operating system recognized the adapter is connected, but if you are not lucky, then install the software CD from a set of headphones in the CD. On the screen the menu should appear in which you need to choose the option to install the driver. Then follow the instructions in starting the installation wizard. At the end of the installation process, the operating system will retry to connect the adapter with the new driver. Install batteries and turn the power on the wireless headphones. The connection procedure is completed. If you want to connect a normal wired earphone, use connectors for plug miniJack (3.5 mm TRS) on the front panel of the system unit. They posted this side of the building two and each has it's own color-coded connector for headphones, in addition to the relevant icon, marked in green. 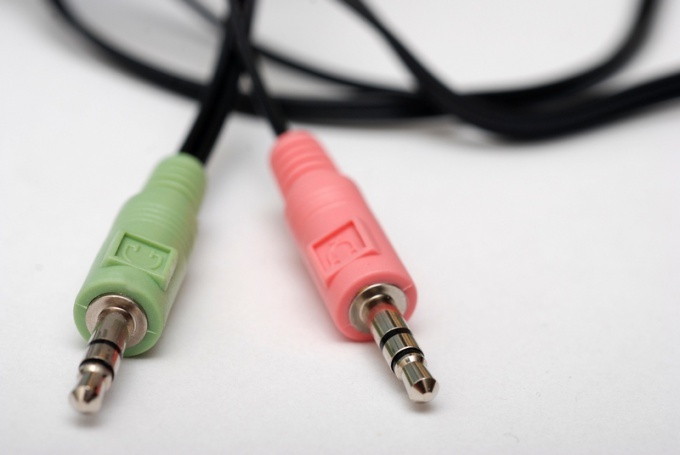 Insert the connector marked with the same color plug of the connecting cable of the headphones. Installed on the system sound card driver may display a dialog box in which you will need to confirm that the connected device is identified by the system correctly. Headphone Jack or speaker and microphone located on the front panel of the computer is often inactive. Collectors just remember to connect. Correct their mistake and to connect the audio device will be much easier. Take the time to look at the manual for the sound card (or motherboard if the audio subsystem is integrated). Find out fitted sockets for audio contacts responsive to the connection plugs. If there is trouble it is better not to produce the possible error in the audio subsystem. Unplug the computer and all attached peripherals. Position the system unit so that it is convenient to maintain. Then remove the left cover (if horizontal - top). 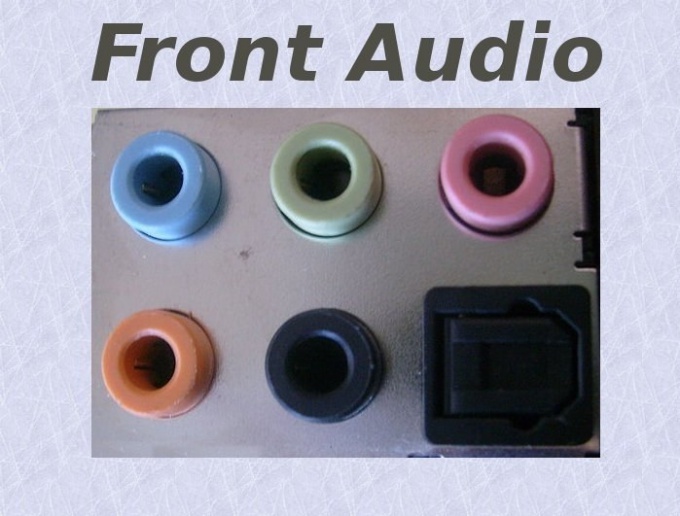 If the body is provided with front jacks for audio devices, inside it you will find two to nothing connected to the socket. They are usually attached to any stand to avoid touch the motherboard and other components. Untie them. Take a look at the back wall - are there any holes for expansion cards, the same which the plugs. If none exist, remove one of the plugs that are better located as close as possible to the sound card. Thread the cables into the hole. Remove card speakers (or headphones) and microphone. Connect instead, plugs in accordance with their colors (red input, green output). Audio device connect the jacks to the front panelwith matching colors. Install on the computer case left cover. Power on the computer and all peripheral devices. Make sure that the sound card still works. If you're in the wrong socket, adjust the connectors on the rear seats. It does not touch the metal contacts and computer case simultaneously, especially if the speakers are working from the network. Better before that, temporarily disconnect them. Further, realizing the fast disconnection and connection of audio devices to the front panel while the computer is also pre-obestochivaete those speakers (and microphones with built-in or external amplifiers), which are fed from the network. 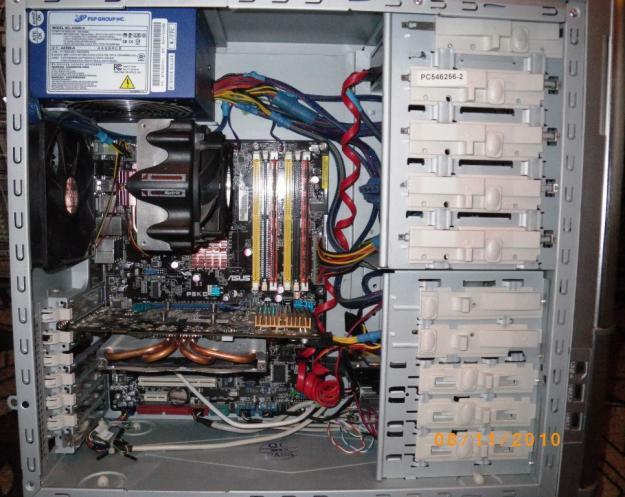 Many computer cases, there are additional outputs of the sound card and several USB ports located on the front panel. Unfortunately, these connectors did not always work consistently. If the headphones or speakers do not reproduce sound signals after you connect to the front channels to check for the required drivers. Click "device Manager". To do this, go to the properties of the item "Computer" and select the appropriate link. Make sure that any equipment is not marked with an exclamation mark. Otherwise, update the drivers for your sound card. Use to find the necessary drivers, the website of the company, which used cost. Better find out the exact model. If you are working with an integrated sound adapter, update the drivers for the motherboard. Check the settings of the front audio panel in BIOS setup menu. Restart the computer and hold the Delete key (Sec, F2). Launch control menu of the computer motherboard. Examine the contents of existing partitions and select "Manu". Open it and select the HD Audio instead of AC97. It should be noted that sometimes it makes sense to switch the mode in reverse order. Save the new settings and again restart the computer. Open the software control sound card and verify that the front panel is not disabled. Realtek utilities, as a rule, a message appears when you connect a new device. Try changing the port assignment by selecting "Front speakers" or "Headphones". If the manipulation did not lead to a positive result, check the connection of panel to the system Board. For this study the user manual to this device. Remove the cover from the system unit. Make sure that certain connectors audio ports are connected to the correct pins of the motherboard. Correct the connection, if you notice a mistake. You buy a used or discarded computer and notice that he refuses to play sounds. There may be a problem in most audio card. But if You are sure that the card is defective, there is a possibility that the sound disabled in the BIOS. So do not just accuse the seller of fraud: maybe the computer was just in the office where unnecessary often disable the built-in sound card. So, check the BIOS. Turn on the computer. On a black screen appears with white letters. To enter the BIOS, in most cases, it is necessary to press the Del key before the operating system. In different versions of the BIOS the start button may differ. Not to be mistaken, look at the bottom of the screen. There should be a sign like press X to enter setup, where X is the input button in the BIOS. If you do it right, you will see the directory indicated by white letters on a blue background. BIOS is "basic input system output" of your computer's hardware and attached devices, including the clock, system plug'n'play, USB, etc. Devices are classified by type and, depending on accessories, are in certain tabs. Select the desired parameter with the arrow keys and press Enter. Built-in sound card will be on the Integrated Peripherals or Advanced - again, depends on the model BIOS. Find the AC97 Audio Select Onboard Audio Controller or (any other similar name containing the word audio). If the option is written Disabled – this means that the sound device is disabled. Modify this parameter, press Enter and select Enabled. To save the settings, follow the prompts printed at the bottom of the screen. If it says F10 - Save, this means that, by pressing F10, you retain options. Perhaps such a function, then exit to the main menu of the BIOS – press Esc and you will be taken to in the previous paragraph. Choose Save & Exit setup (or Exit & Save Change). The system asks the question highlighted in red: Save to CMOS and EXIT (Y/N)? It means "to Save the settings and exit (Yes(true)/ No(no))?". Press Y. If you doubt the correctness of the performed actions, press N or choose to Exit this item without saving, which means "Exit without saving". The computer will go to reboot. No longer go into the BIOS and allow to boot the operating system. When it loads, the speakers will sound the call to boot the system. So you determine, involved whether the sound. Model and BIOS manufacturers may vary. 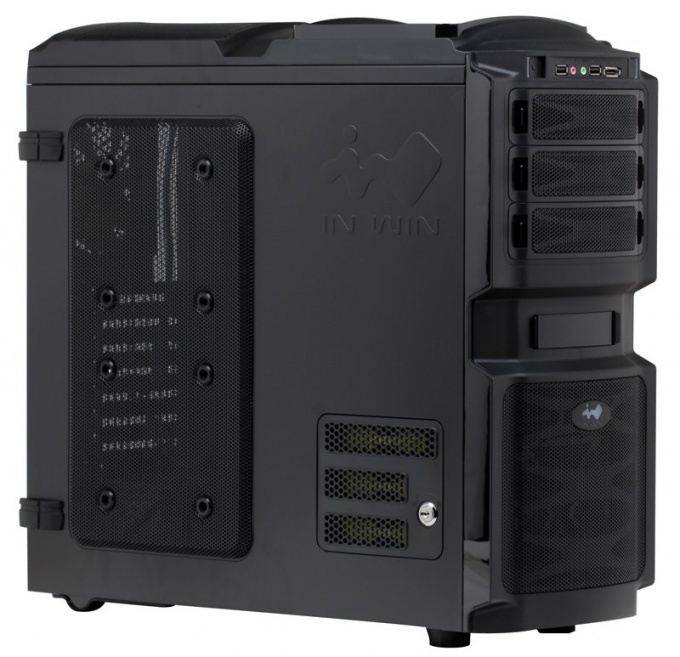 If the above tips did not help you and you did not find the relevant BIOS - look for information on your version on the official website of the motherboard manufacturer. 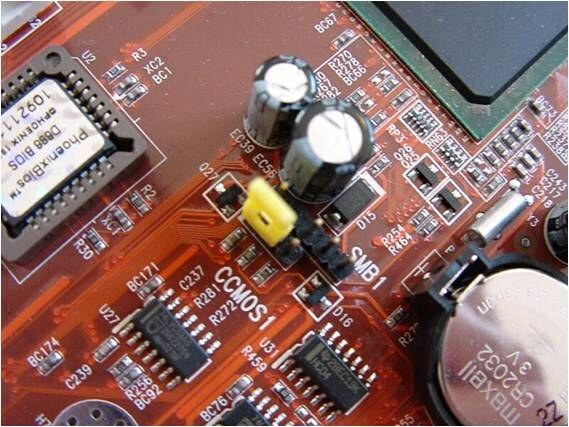 BIOS, or basic input system output gives the operating system access the hardware resources of the computer and performs the initial stage of its download. 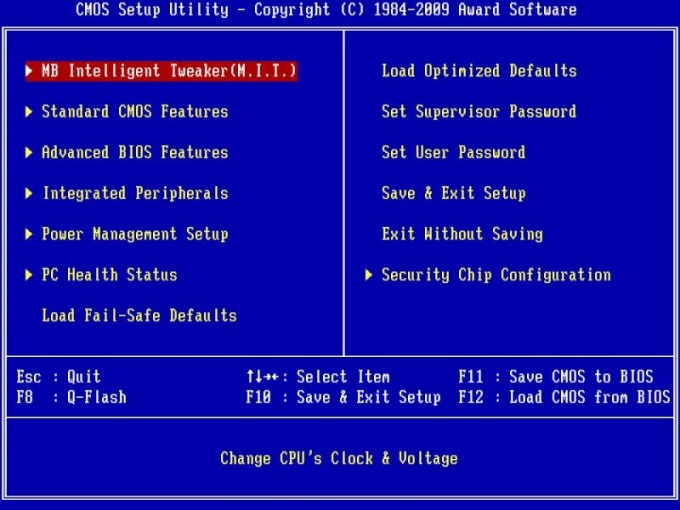 In addition, in the BIOS you can configure many parameters on the computer. In particular, switching on and off some devices. To make in the BIOS any changes, you first need to enter it. To log into the base system I / o can be used in a variety of keys: Del, Esc, F1, F2, F3, F10. Sometimes used shortcuts: Ctrl+Alt+Esc, Ctrl+Alt+Del, Ctrl+Alt+Ins, Fn+F1. Often at the start of a tooltip – for example, Press Del to enter setup. After you enter the BIOS, find the section Integrated Periferals and look for it in the sound card. If there is a value of Disabled (disabled), change it to Enabled (enabled). Save the changes by pressing F10. In the resulting confirmation window, click Yes or type Y and press enter. Note that to include in the BIOS the integrated sound card is not required, the system detects it. If your computer has no sound, the problem may be not related to the BIOS. Before you open the base system I / o should check to see whether the operating system sound card. Click on the desktop, right-click the icon "My computer" and select the context menu item "Properties". In the opened window click the "Hardware" - "device Manager". Locate the line "Sound, video and game controllers". In that case, if there are devices marked with yellow question or exclamation mark, the problem with no audio will be solved after installing the device driver. Most often it is Realtek High Definition Audio. 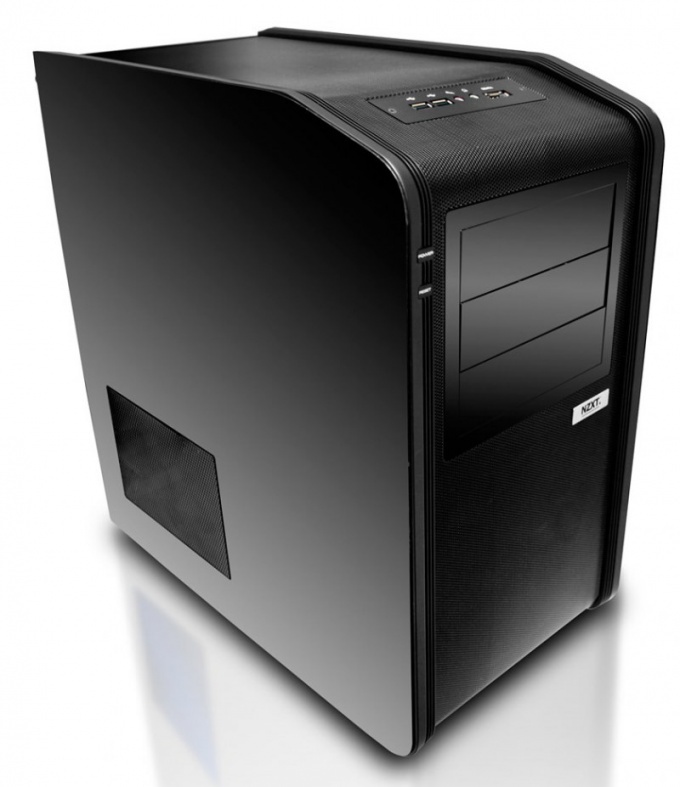 The driver can be found in the Internet or the installation disk with the operating system. Note that on the installation disk of the driver packs are usually in zip files. Find archives of the drivers by name single pack with sound drivers. Unzip it to a folder on the computer, and then start the driver and specify as the source folder you want. After finishing the installation, restart the computer. Currently, there are two most common specifications for different computer audio - AC'97 and HD Audio. The second should replace the first, but the process is not yet complete, so while there are both architectures. 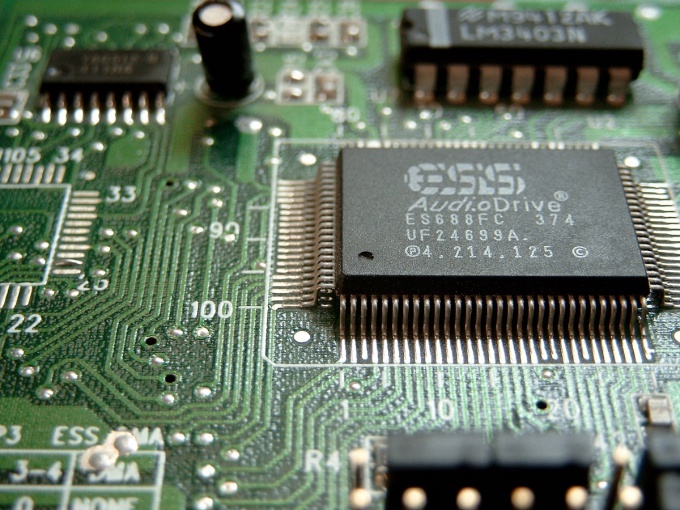 Many motherboards place in the BIOS setup, using which the user can choose the specification for the inputs and outputs of audio devices on the front panel of the system unit of the computer. In the latest versions of operating systems are the default drivers that are designed to work on the architecture of HD Audio. So if you after use, for example, Windows XP SP2 installed Windows 7 and found that the connectors for headphones and microphone on the front panel stopped working, it is likely that this is the reason. However, before proceeding to solving the problem at the level of the motherboard, try to eliminate it by means of the OS. First, make sure that you have installed the Realtec driver, which can work not only with the "native" format AC'97, but with HD Audio. Secondly, try to disable in the settings control panel, Realtec the option auto-detect front panel - this is often enough to solve the problem. If the measures outlined in the first step, if that fails, look for the switch AC'97 / HD Audio in the settings of the underlying system I/o - BIOS. To do this, from the main menu system to initiate the restart the computer and press the Delete key or F2 after the start of a new load cycle. Some of the computers to log into the control panel settings BIOS used other combinations, so in case of failure of these keys, specify a valid combination in the description of your version of base system of input/output. Often it is possible to learn from the inscription that the boot process appears in the lower left corner of the screen. Panel BIOS settings, find the line with the setting belonging to the front panel. For example, in versions of AMI company, it can be placed on the Advanced tab, and formulated as the Front Panel Type. Change the value in this row - if the panel connectors are not working when set to HD Audio, change it to AC'97 or Vice versa. Then exit the BIOS, saving the changes. 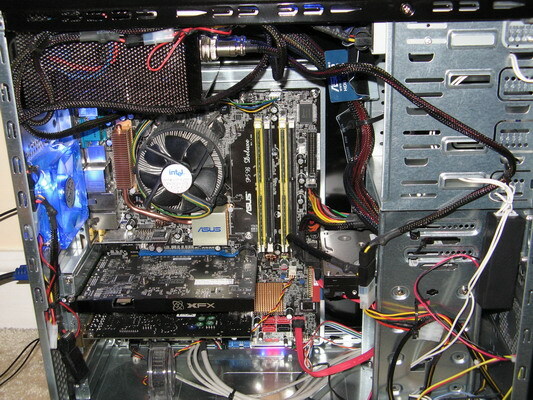 If the desired settings do not appear in your version of the base system, it is possible that the switching is done mechanically, with a jumper on the motherboard.